Tickets for the historic 20-July matchup between Manchester United and Inter in the 2019 International Champions Cup Singapore presented by AIA, are in record demand. In a matter of hours all available inventory to date is sold. However, we expect to release additional tickets in the coming weeks. Please follow us on our website www.internationalchampionscup.sg and social media channels for further updates. Also selling fast are tickets to the Juventus and Tottenham Hotspur match on 21-July. Click “BUY TICKETS” on this page to get your tickets now. 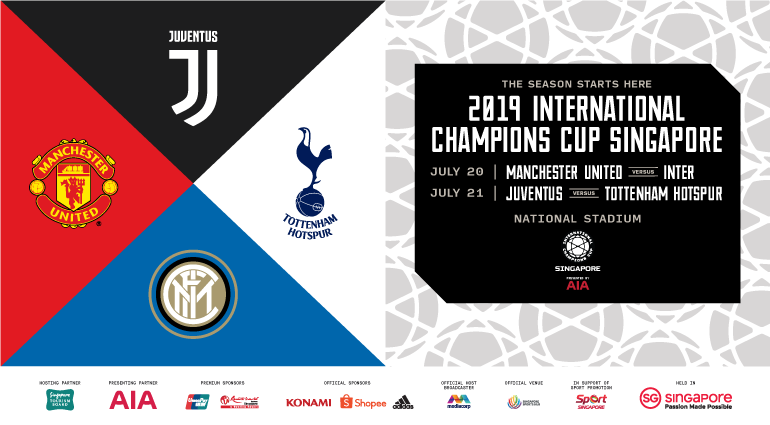 The 2019 International Champions Cup Singapore presented by AIA will feature four of Europe’s top clubs play at the National Stadium in July 2019! - UnionPay Cardholders enjoy exclusive pre-sale from 28 March (12pm) to 31 March (12pm), and 10% off tickets from 28 March (12pm) to 30 April (12pm). 12:00PM onwards via Internet, Singapore Indoor Stadium Box Office, Scotts Square Concierge Desk and The Star Performing Arts Centre Box Office. *UnionPay discount doesn’t apply to any packages, Field Seats or any discounted tickets. 2-Day Packages: Valid for all categories except Field seats. The same price category and quantity must be selected. Not available at SingPost outlets. Infants in arms and children under 3 years of age may be admitted free of charge provided they do not occupy a seat (they must be seated on the lap of a parent or guardian). Children aged 3 and above must purchase a ticket for admission. Professional photography and videography are not allowed.